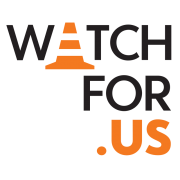 For Watch For Us materials and resources, download the WatchForUs Campaign Toolkit. It includes links to videos, infographics, and social media materials you can share with your workers, friends, and family. Please share the videos, distribute the infographic, use the social media tools, and promote the WatchForUs website. All campaign materials can be found online at www.WatchFor.Us/toolkit. Please lend your voice to the movement. 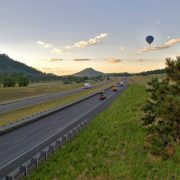 For 45 years, contractors, suppliers, governmental agency representatives, and consultants from the Rocky Mountain West have held an annual conference in Colorado to discuss new developments and quality advancements of asphalt pavements. Recognized as one of the largest regional conferences on asphalt pavement technology, the Rocky Mountain Asphalt Conference & Equipment Show draws attendees from throughout the Rocky Mountain region. National speakers marvel at the diversity of topics along with the multiple attendee areas of interest. As long as issues and new technologies emerge in the asphalt pavement industry the Rocky Mountain Asphalt Conference & Equipment Show will continue to grow and expand to meet the needs of the asphalt industry. Come join us for the 45th Annual Rocky Mountain Asphalt Conference and Equipment Show February 21-23, 2018! The Conference and Trade Show will be held at the Crowne Plaza DIA. Hotel rooms sell out early so reserve your room ASAP! Click the link below and use the booking code CAR. You can also reserve your room by calling 1.866.378.1583 and use the booking code CAR. How can asphalt help save the environment? How can asphalt help save the environment? Verizon’s intelligent network of sensors and cameras will give cities the ability to study and analyze the flow of traffic and relay that information to operations centers, who will then use it to make communities safer, smarter and greener. Cutting carbon dioxide emissions and commute time for thousands of drivers. Take a look! Asphalt is the sustainable material for constructing pavements. 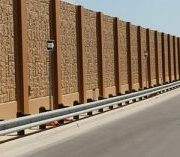 From the production of the paving material, to the placement of the pavement on the road, to rehabilitation, through recycling, asphalt pavements minimize impact on the environment. Low consumption of energy for production and construction, low emission of greenhouse gases, and conservation of natural resources help to make asphalt the environmental pavement of choice. Whether you’re driving, running or cycling through the great Colorado Outdoors, choose asphalt pavements for the SMOOTHEST ride to make your favorite spring activity even better. On Wednesday Evening February 22, 2017, the “Best in Colorado” Asphalt Pavement Awards will be handed out to the asphalt paving projects who exhibited great quality during construction in 2016. There were 68 projects nominated for the program in 2016. Our judges worked very hard to complete the evaluations of each of the 68 projects around the State. The majority of the evaluations were completed by the end of December 2016. There will be 12 different awards presented. All of these awards along withthe CDOT Production awards and CDOT Smoothness awards will be presented before more than 350 industry people at the awards banquet which will be held at the Crowne Plaza Hotel – DIA @I-70 and Chambers in Aurora, Colorado. The awards dinner is open to all and reservations can be made by visiting www.rmaces.org. The dinner is associated with the 44th Annual Rocky Mountain Asphalt Conference and Equipment Show (RMACES). The RMACES is the largest “Asphalt Only” trade show in the US in 2017. The expected attendance will be near 1500 people. There will be more than 58 breakout sessions over the 2.5 days of the conference from February 22 to February 24. 2017. Chris Robinette, Quality Control Manager and David Tafoya, Superintendent, of A&S Construction Company. 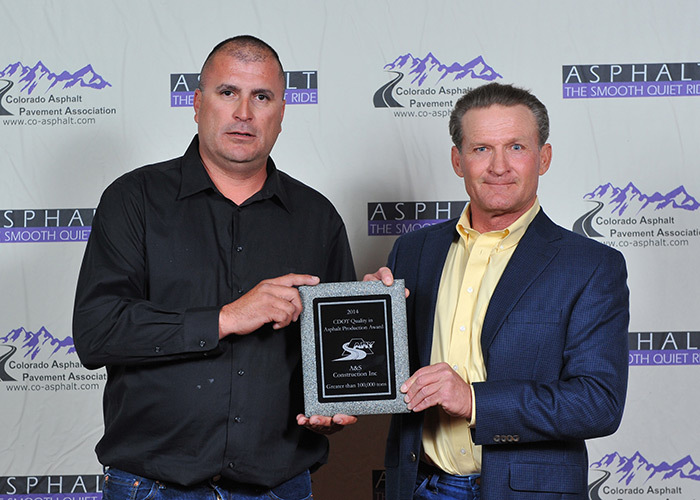 A&S Construction Co. Inc. of Canon City recently won the Statewide Quality Award from Colorado Department of Transportation (CDOT) . The award is given to the company that most consistently provides quality materials on CDOT projects during the construction season. Accepting the award on behalf of A&S Construction Company were Chris Robinette – Quality Control Manager and David Tafoya – Superintendent.